Congress-NCP Govt Has Built More Houses Than It Claims! The Maharashtra Government, in the course of an advertising blitzkrieg on TV, radio and social media, is expected to spend up to Rs 150 crore in the run-up to the assembly polls scheduled forOctober 15. The Maharashtra Congress Facebook page makes many claims. IndiaSpend is fact-checking some of them. We started the series probing the assertion that 25,000 toilets were built in Mumbai (which turned out to be a half-truth). 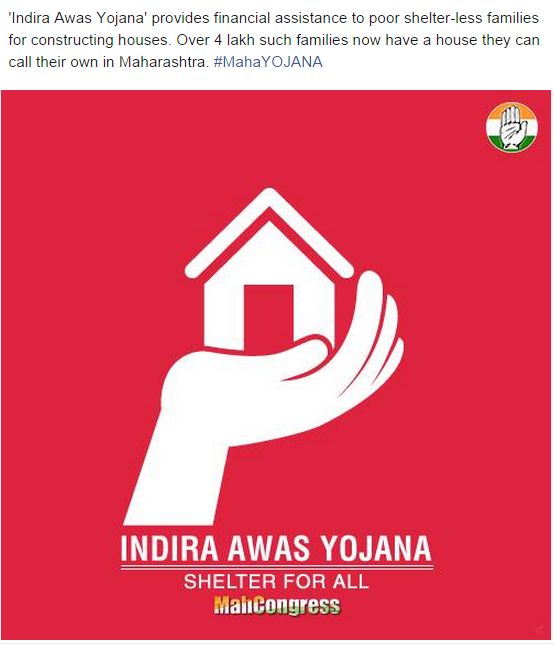 Let us now look at this claim: “Over 4 lakh families in Maharashtra have a house they can call their own, thanks to Indira Awas Yojana.” As we found, the claim was more conservative than the truth. Indira Awas Yojana (IAY), a central Government programme, was launched in May 1985. The programme finances the construction of new homes and upgradation of old ones for the rural poor. The money is contributed 75% from the centre and 25% from the states. The Congress-Nationalist Congress Party (NCP) alliance was been in power for two terms, from 2004-05 to 2008-09 and again in 2009-10 till 2013-14. The performance of IAY during the two terms. During its first term, the Government managed to build nearly 329,277 housing units. The real boost to the scheme was given during 2008-09, when 114,176 homes were built. During its second term, the Government built 715,339 homes. The highest number of houses, 205,149, was constructed in 2009-10. So, our analysis shows the Government has actually created more houses than it is taking credit for! These are fake figures. NSSO has not done audit. NSSO people have taken money from NCP-Congress! Where are the houses, pictures please. Whom are they given to, NCP, Congress cadre? ?